A couple of months ago when Too Faced released a second concealer, I did a comparison post (here) so when I bought Charlotte Tilbury Magic Away Concealer, it occurred to me that I should do a similar post because most people will purchase one, but not both concealers. 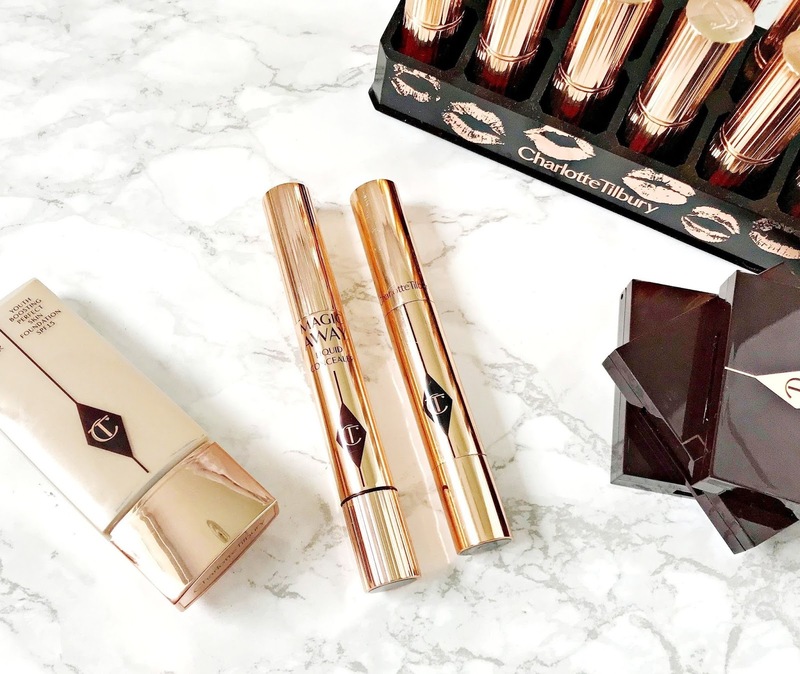 Because Charlotte Tilbury is Cult Beauty's September's Brand Of The Month, there is free worldwide shipping on all products so I thought it was a good time to do this post! The Retoucher: I bought this concealer after initially trying a few samples that were free with orders. It has twist pen dispenser with a brush to apply the product. The coverage is medium, although buildable. The formula is more hydrating than drying, yet it isn't slippy - it does dry down and the finish is pretty natural - I'd say satin. I like that I can use this on areas of redness, on blemishes and the under eye area and it never looks cakey and doesn't separate. What I love most about this product is that I can touch up my makeup throughout the day as it applies well over other base products and blends seamlessly without looking like I have applied more product. It would be ideal if you want to freshen your makeup for going out after work. If you have very dark circles, you may find that this doesn't provide enough coverage, but combined with a corrector, it would work well for you. Available in 10 shades. It contains 3.5ml of product for £25. Magic Away Liquid Concealer: This concealer gives more coverage than The Retoucher - I would say that it is pretty much full coverage with a demi-matte (not flat) finish. It literally erases my dark circles and I love the doe-foot applicator as it's so easy to get into the crevices of my under eye area. What I love about this concealer is that it doesn't dry my skin out or exaggerate fine lines. It can crease ever so slightly but nothing that a quick dab doesn't sort out and I also find that it doesn't budge at all. It also works on blemishes and areas of redness and pigmentation to create a flawless base. I especially love that there is a transparent panel on one side so I will be able to see when I am running low - something all concealers should have! Available in 16 shades. It contains 4ml of product for £24. As with all Charlotte Tilbury products, the packaging is stunning - rose gold with burgundy accents. The only drawback of the Magic Away Concealer is that the product can leak onto the inside of the lid but it isn't a deal breaker. Do you need both? Probably not. It really depends on the level of coverage you favour as you will definitely achieve full coverage with the Magic Away, whereas The Retoucher has medium coverage. Both are slim in size, perfect for travelling or popping in your handbag and both contain a similar amount of product. Have you tried either of these concealers? I would love to hear your thoughts! Available from Charlotte Tilbury, Cult Beauty, Feel Unique, Selfridges, John Lewis, Arnotts, Brown Thomas.